Netbet have been kicking around the betting industry since 2001, but now they have developed into more than just a sports book, with casino and poker offering for their customers as well. It’s pretty fair to say that the company aren’t the most iconic in the industry, but they are a brand that if you aren’t familiar with, you should be! 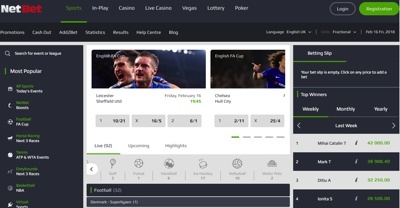 What’s been interesting to see about Netbet is their willingness to improve, highlighted by the companies recent facelift in both their casino and sports offerings. The company has been kicking about since 2001, which is actually quite a long time, considering that they are really thought of as one of the major players in any aspect of the gambling industry. However, the time gives them experience and this is often one of the most valuable tools in the industry, making them into a force that should at worst be considered before choosing a rival brand. Netbet, based out of Malta are licensed by the UK Gaming Authority, which is one of the high accolades for any gambling company wanting to offer first class support to their customer base. This allows them to trade to a number of different countries around the world legally. The company have taken big strides over the last couple of years and to be honest, the time and money put into improving the brand is certainly starting to show. We were highly impressed with the casino, poker and sportsbook, although it’s clear that the sportsbook has probably seen the most in terms of investment over the last few years. If the company continue to do what they are doing, then they are going to be a strong option for all players of all disciplines over the next few years. The bookmaker is probably the most complete section of Netbet and with it you are getting a really strong range of sports and markets to bet on. We were impressed with the latest ‘blog’ that has been included online, with articles written specifically for sports bettors by knowledgeable folk in the Netbet team. The casino at NetBet is predominantly powered by Microgaming, although it does partner up with a couple of smaller sites as well. This allows Netbet to offer up a huge range of games to the market including a very impressive slots catalogue. Some of the highlights included Jimi Hendrix, Monopoly and King Kong. Outside of slots the table games that are on offer were of a good standard as well, making the casino a more than solid option for most punters. NetBet is run on the PlayTech software for their poker room and with this comes a reasonably good range of gams and player numbers to play against. 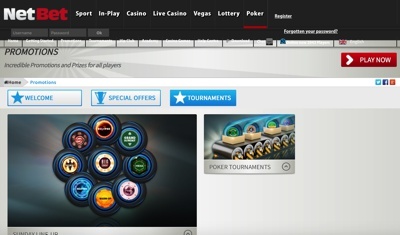 The most popular forms are that of Texas Hold’em, but you can of course play Omaha and a series of mixed games as well.